These medals are available by application. Application forms are available to download. The Australian Defence Medal recognises Australian Defence Force personnel who served after 3 September 1945 and have completed either: an initial enlistment period, or four years of efficient service,whichever is the lesser. 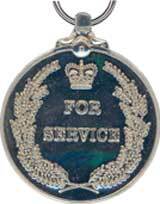 The Anniversary of National Service 1951-1972 Medal (ANSM) was introduced in 2002 to recognise those who completed their obligation under the two National Service schemes that had operated in Australia between 1951 and 1972. Eligibility for the medal is dependent upon a person's obligation to serve and upon this obligation being fulfilled under the National Service Act 1951 (As Amended), as it applied to the individual at the time of his service. Additionally, he must not have been discharged for disciplinary reasons. No women were conscripted under the National Service Act. Click here to download an application form. Mounting your medals can be a costly exercise. 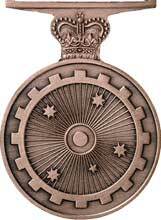 The Medal shop offers the best prices available and the highest quality workmanship. Please support the Medal Shop. The Medal Shop does not pay the webmaster for this advertisment. Warwick Cary, the owner, provides presentation material without cost to the RAAMC Association who allows doc to park this site on their hosting service free of charge.